April was going pretty slowly in terms of Zombology sales, I’d been focusing on FlickFleet again (and learning about Kickstarter! - Jamey Stegmaier’s book is great by the way), and although I’d made a batch of Zombology I’d not sold any at all. My sales targets are pretty low and I’d already missed last quarter’s by a little, so I wasn’t relishing the chance to slip back by another whole month. 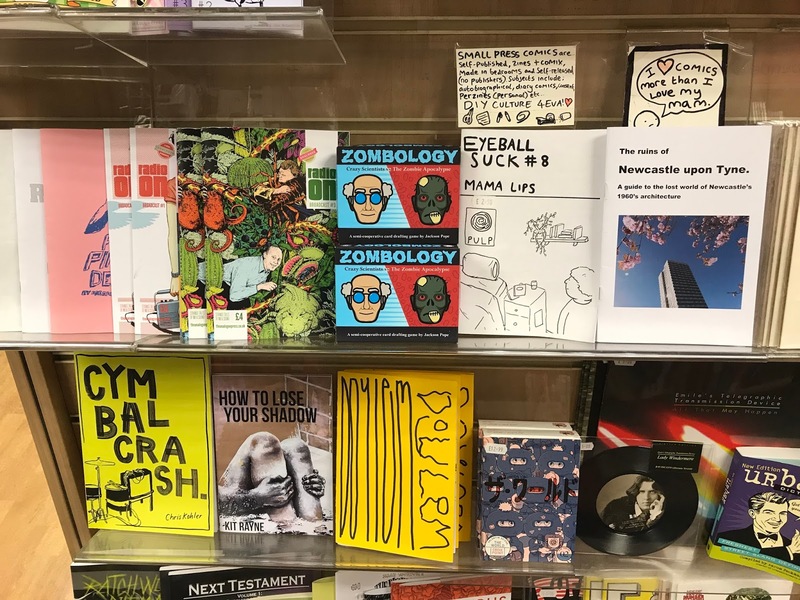 I popped into my local FLGS, Travelling Man and they have a small press shelf where people who hand-craft comics can sell their wares. They were willing to take on Zombology too. I chose a price - £12.99, similar to other similarly-sized games in the store, and it has the benefit that it’s cheaper for the customer than buying it from my website with UK shipping, but means that after the shop’s cut the take home for me is similar to a web sale after PayPal fees and shipping. I gave them three copies on sale or return on Thursday and by Monday they’d already sold one! This was the start of a great week. I got another order on Tuesday while on the train to Manchester for work and then sold a couple to people I’d met through work on Friday and then another online order on Friday evening. Saturday one of my tweets went unexpectedly ‘viral’ (viral for me - it got a bunch of RTs from people I don’t know including John Kovalic, the artist of Munchkin) and I got a couple more orders - including my first Print and Play one! Saturday I also made it along to Newcastle Gamers for their International Tabletop Day session - I just joined for a couple of hours in the evening, but I got to play a few games of mine and Sentinels of the Multiverse for the first time (I wasn’t a fan - maybe we had an unusual set-up or draw, but it felt very mechanical). Finally, this morning when I checked with Travelling Man they'd sold another one too, so I delivered them another two and invoiced them for the two copies they've sold. I've ended April ahead of target! This week I’ve got Newcastle Playtest on Tuesday and then Games Night on Thursday before a weekend away to celebrate our 15th wedding anniversary! Time flies! This week has been all about tweaking FlickFleet. There are now three blindplaytesting copies in three different countries. Three sets of people trying to learn the game from my rulebook and then provide feedback on the rulebook and the game. The first set of feedback has come in with some great suggestions for improving the rulebook and some comments about the game. The playtester found the game fundamentally fun and loved a few bits about it, but there were a couple of things he didn't enjoy. The biggest problem he has was that it is possible to get yourself into a situation where victory is impossible for one of the players. 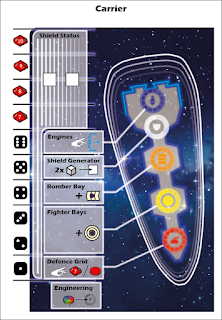 I'd seen this happen a few times - it's an asymmetric game, so the players often have different forces, and some of the ships need to be played in a particular way to be successful (e.g. carriers need to launch their fighters and bombers quickly as they are weak on their own) and the ramming rules were an attempt to dealt with this, but clearly for new players without my experience (or strategy advice) the problem was bigger than I realised. Clearly this situation is no fun at all for the loser and not much fun for the winner, so it was something that needed addressing. The playtester had even volunteered a couple of suggestions that he thought might fixed the problem - which was great. As a designer you will get a lot of suggestions about your game. Some will be great, some will be rubbish. Some will be great, but take your game in a direction you are unhappy with. One of the things you need to be good at is to take the suggestions (and where not spelled out work out the root issue) and then decide what to do with them. Are they a good idea? Do they take your game in a direction you are happy with? What's the problem the suggestion is trying to fix? Is there a better or different solution to that problem you should also consider? Is that problem just that the the game is not the suggester's type of game? 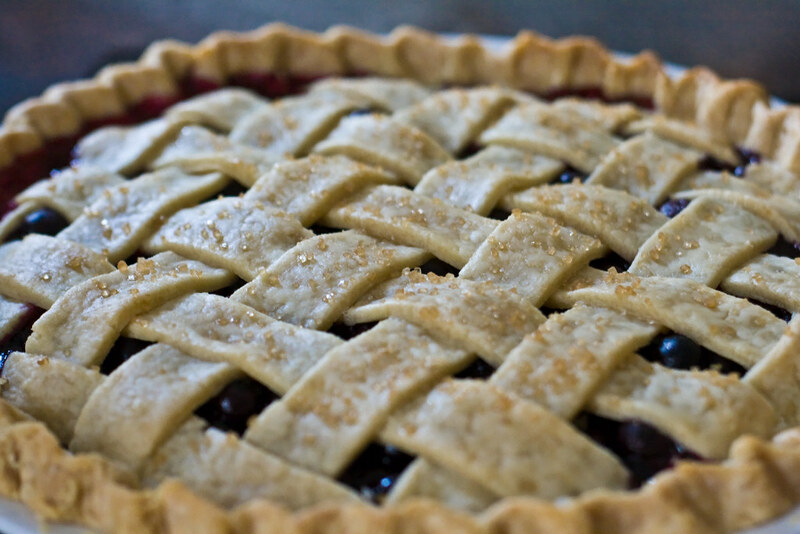 Perhaps the suggester's perceived problem is not a problem in your eyes, or something you are happy to live with? As creator of the game, the editorial control lies with you until you sign it over to a publisher. As it turns out the problems spotted by the playtester were an issue and something I wanted to address. Paul (my co-designer) and I talked it over and we had an alternative solution that we've been trying out this week (and over the weekend while Paul was visiting with his family). It seems at first blush that our solution improves the game and largely addresses the problem. As a result of this feedback the game has improved, despite the fact we didn't go with the playtester's suggestion. Hopefully, he will find our solution addresses the problem as he experienced it too. Remember that playtesters suggestions are valid, and are shaped by their experience of your game. But the control lies with you. Are you happy to leave the problem they experience un-addressed? If not, is their suggestion the best resolution to the problem they experienced? It might be. Or it might not. You decide! I'm currently on holiday in Bristol, so I'm auto-posting this post that I wrote last week. 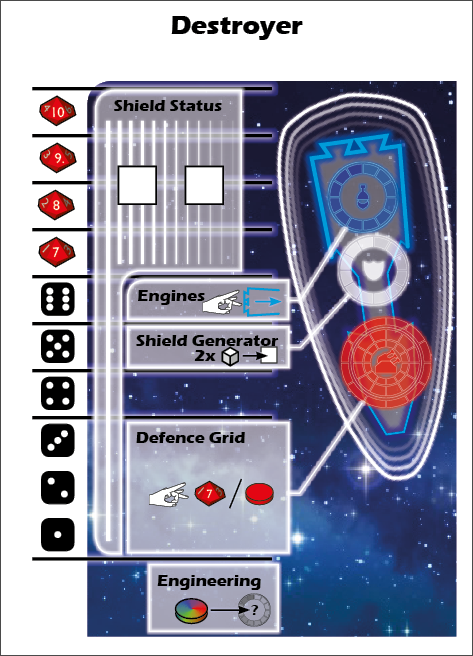 Over the last couple of weeks I've started to make a more 'finished' looking set of ship dashboards for FlickFleet. 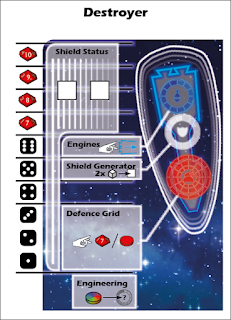 These dashboards serve two purposes - they remind you what actions each ship can take and they show the status of the ship in terms of whether the shields are still up and which bits of the ship are currently damaged and inoperable. There are three types of large ship in FlickFleet - destroyers, carriers and dreadnoughts. Each has different capabilities, strengths and weaknesses. Here are the latest versions of their dashboards, I would really appreciate any feedback you have on the look, and also the clarity of information. 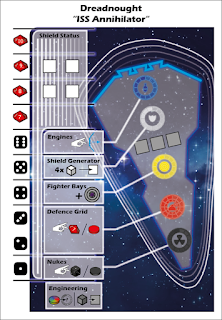 The destroyer has two shields (damaged on a 1-10 die result), 3 guns (damaged on 1-3), plus shield generator (5) and engines (6). A result of four will destroy them once their shields are down. They can be moved by flicking the rear three surfaces, as long as the engines are not damaged. They also have an engineering location that cannot be damaged that allows you to repair a damaged location. 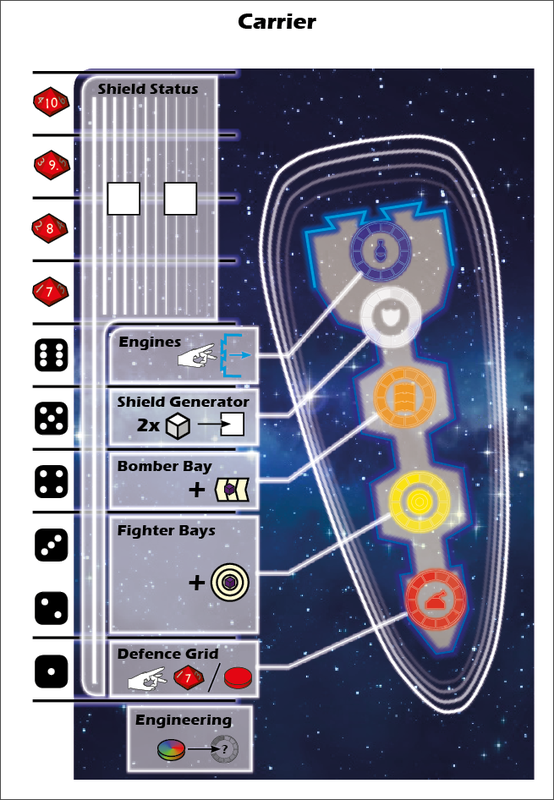 The carrier has two shields (damaged on a 1-10 die result), a gun (damaged on 1), a fighter bay (damaged on a 2 or 3) that allows you to launch a couple of fighter wings during the game, a bomber bay (4) that allows you to launch a bomber wing, plus shield generator (5) and engines (6). They can be moved by flicking the rear three surfaces, as long as the engines are not damaged. They also have an engineering location that cannot be damaged that allows you to repair a damaged location. 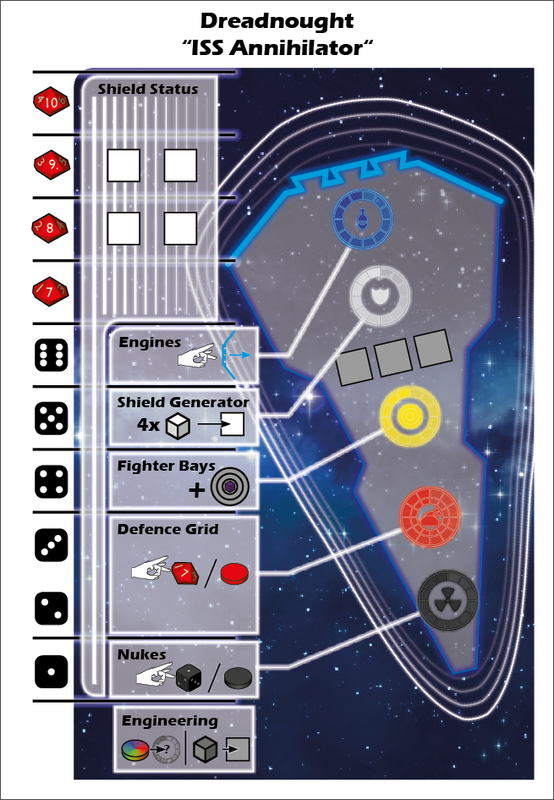 The destroyer has four shields (damaged on a 1-10 die result), nuclear warheads (damaged on 1), two guns (damaged on a 2 or 3), a fighter bay (damaged on a 4) that allows you to launch a couple of fighter wings during the game, plus shield generator (5) and engines (6). They can be moved by flicking the rear three surfaces, as long as the engines are not damaged. They also have an engineering location that cannot be damaged that allows you to repair a damaged location or repair the hull. In addition to the locations above, dreadnoughts also have three hull points. How clearly do you think that information is portrayed? Do you like the look? Any thoughts or comments?